Warhorse Leather Soap and Conditioner works to shine and restore your leather. Boots, purses, jackets, horse saddles, tack… just read the reviews! The leather cleaner is fantastic. It cleans sweat off our tack very well and keeps our tack soft, supple and shiny. A small amount mixed with water in a spray bottle is great at removing the sweaty, dirty grime from the inside of riding boots, and leaves a nice shine when wiped over the whole boot. The product is easy to use. I use it straight — just a few drops on a damp sponge — then I use a dry sponge to wipe off the excess. It doesn’t leave a residue in the handiwork and brings out the color in the tooled leather that you see here. This is a custom-built saddle, and we’re pretty particular about what we use. The smell isn’t industrial and my hands feeling good afterwards is an added bonus. Thank you very much. We love it. Our leather couch looks wonderful and so does my purse. 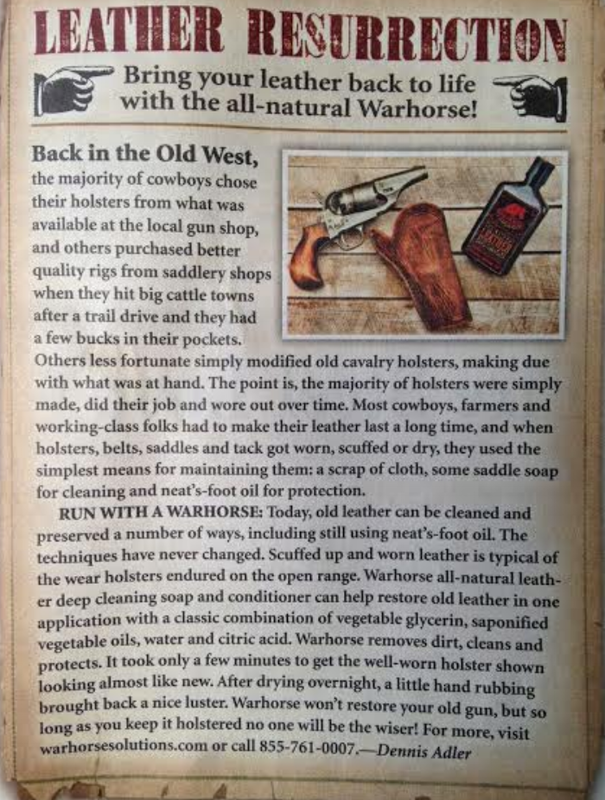 We cleaned all of our used saddles with your Warhorse leather soap. It really cleaned and put some sort of a “glow” on the leather...they have never been more beautiful and supple! We select [products] for publication based on the experience and knowledge we have of many companies and products out there…In this instance, we did use the leather cleaner on a well-used Vanson leather jacket and were pleased with the results. Your product is great. Warhorse cleans as well as moisturizes the leather. 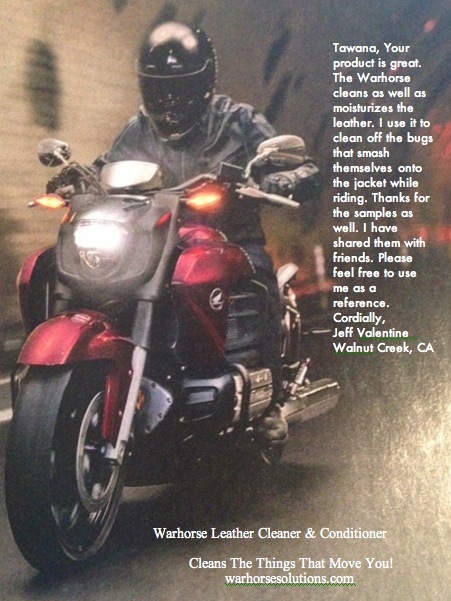 I use it to clean the bugs that smash themselves onto the jacket while riding. Thanks for the samples as well. I have shared them with friends. Warhorse’s all-natural, deep cleaning leather soap and conditioner can help restore old leather in one application with a classic combination of vegetable glycerin, saponified vegetable oils, water and citric acid. Warhorse removes dirt, cleans and protects. It took only a few minutes to get the well-worn holster shown looking almost like new. After drying overnight, a little hand-rubbing brought back a nice luster. Warhorse won't restore your old gun, but so long as you keep it holstered no one will be the wiser! 30-year-old boots look as good as the day I bought them. After leaving a pair of thirty-year-old boots in a damp environment for too long, they had gotten moldy. I tried Warhorse leather cleaner on them and they looked as good as the day I bought them. Couldn’t believe the difference! 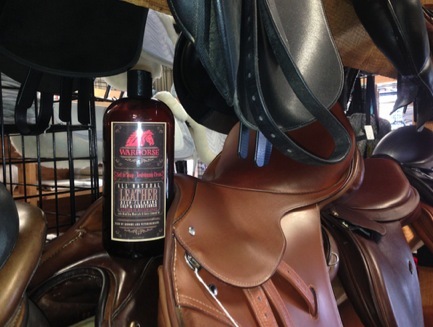 Warhorse’s leather cleaner deep cleans and conditions without leaving any sticky residue like other cleaners. Effective to use for oiling tack as well it can revive dry or old leather in one coat. Warhorse Leather Cleaner works great. It cleans well and leaves leather super soft after using. It even makes your hands feel soft as well. 18-year-old Jetton leather furniture lives! Warhorse leather soap and conditioner brought my 18-year-old Jetton Leather furniture back to near-new condition. I love my leather furniture, but at 18 years old, it had been a chore to keep it clean and properly conditioned. Over the years, I have tried cleaners which did little if any to condition the leather. I have used conditioners which did little if any cleaning. I noticed that some of the seating surfaces were in dire need of my attention, and decided to give Warhorse a try. WOW!!!! Warhorse is the most efficient cleaner and conditioner I have used. The cleaning properties were so efficient that no scrubbing was needed. Just follow the instructions, and the soiled areas wipe clean. The dry leather “drank in” the conditioner almost as quickly as the cloth pulled the soiled spots away. Within minutes, I would have been comfortable sitting on the furniture with my best dress pants. There was no oily or waxy residue. I took before and after pictures, which are attached. The dry faded picture is the “before” and the other is how it looks now, nearly three weeks later. I will never use any other product on my leather furniture. I am also now using Warhorse All-Purpose Cleaner as my go-to cleaner for a multitude of tasks at home and at work. It is hard to beat Warhorse’s products, especially with their commitment to delivering only environmentally friendly products which actually work. I just finished using the leather soap and conditioner on my riding boots and dressage saddle and feel the need to e-mail you about the results. Spectacular! The saddle has two different kinds of leather: one is smooth and the other has a grain. The grainy part has always been a challenge to get right. After Warhorse, it looks like new! As if that weren’t enough, I had a little left and tried it on our glass shower stall doors. They also have a grainy surface that holds onto mineral deposits from the soap and water and never really look clean, even with scrubbing. They do now, and I didn’t have to scrub.